This book was completely designed in-house by ECPrinting.com. 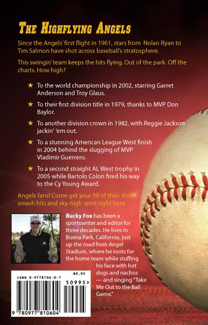 Since the Angels’ first flight in 1961, stars from Nolan Ryan to Tim Salmon have shot across baseball’s stratosphere. This swingin’ team keeps the hits flying. Out of the park. Off the charts. How high? • To the world championship in 2002, starring Garret Anderson and Troy Glaus. 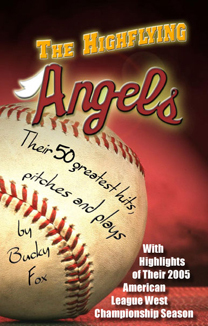 • To their first division title in 1979, thanks to MVP Don Baylor. • To another division crown in 1982, with Reggie Jackson jackin’ ‘em out. 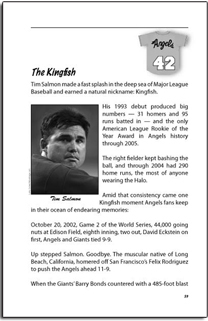 • To a stunning American League West finish in 2004 behind the slugging of MVP Vladimir Guerrero. • To a second straight AL West trophy in 2005 while Bartolo Colon fired his way to the Cy Young Award. Angels fans! Come get your fill of their thrills, smash hits and sky-high spirit right here. Available at Amazon.com and directly from the author.